Bite-sized, buttery caramel centers covered in creamy milk chocolate! A classic combination, which comes in the original theater box as well as a new, resealable to-go pouch that travels well. 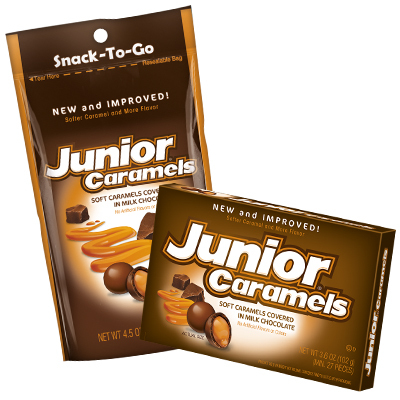 So indulge, snack, share, and be happy - everywhere you go with Junior Caramels. Now made with our new & improved formula! 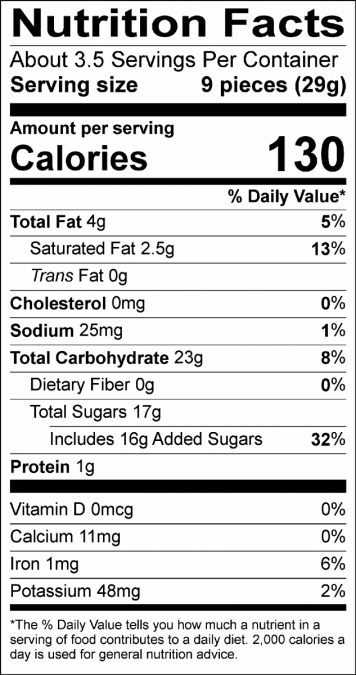 Ingredients: Milk Chocolate (Sugar, Cocoa Butter, Chocolate, Milk, and Soy Lecithin - an Emulsifier), Sugar, Corn Syrup, Palm Oil, Dry Whole Milk, Mono and Diglycerides, Natural Flavors, Whey, Confectioner's Glaze, Salt, Food Starch-Modified, Soy Lecithin. Contains Milk, Contains Soy, Egg may be present.